As the White House officially dropped the ax on its participation in the Joint Comprehensive Plan of Action (JCPOA), the landmark multilateral nuclear accord with Iran, instead opting for a policy of extreme hostility, reports have indicated that CIA-funded analytics company Palantir Technologies Inc. plays a pivotal role providing intelligence on the country’s peaceful nuclear program to the International Atomic Energy Agency (IAEA), casting new light on the agency’s invasive inspections regime. The company – a major U.S. government contractor co-founded in 2004 by right-wing libertarian tech investor, PayPal founder, and billionaire Donald Trump supporter Peter Thiel – has built a colossal intelligence and predictive-policing database since it began as a Pentagon and CIA contractor in Afghanistan and Iraq, assisting U.S. counter-insurgency efforts and helping troops avoid IEDs. Since then, the secretive tech platform has expanded to become the premier engine for civilian, law enforcement, and intelligence agencies keen on mining and sorting vast amounts of data. According to Bloomberg, Palantir’s Mosaic software is also being used by the IAEA to sort classified data related to Iran’s nuclear program into maps and visualized connections among Iranian officials, locations and material. Given Palantir’s connection to the Cambridge Analytica scandal – which saw 87 million Facebook users’ data breached on behalf of the Trump campaign – as well as the close personal ties between Trump and Thiel, who has acted as a sort of Silicon Valley advisor to the president, the usage of Palantir software by the IAEA raises questions about the agency’s role as a neutral body, rather than as a proxy for intelligence-gathering by Iran’s opponents. Palantir’s software allows users to investigate and parse disparate data such as social media posts, satellite maps, cellphone records, and airline reservations — discovering linkages that intelligence analysts could easily miss and visualizing the data through user-friendly graphics such as spider webs. Palantir has helped build a sprawling global database for the National Security Agency (NSA), assisted probes by the FBI, formed the backbone of major police departments’ databases in cities such as Los Angeles and New York, and has helped vet travelers and track immigrants for the Immigration and Customs Enforcement mass-deportation apparatus. Reports indicate that a version of the software named Mosaic, tailored specifically for the IAEA, has served as the foundation for the agency’s planning and execution of unscheduled probes at facilities linked to Iran’s nuclear program. Completely unique and unparalleled intrusive verification regime. Given the mandate of the IAEA – which was founded in 1957 to safeguard the peaceful use of nuclear energy while inhibiting its military application – the agency’s use of Palantir poses the danger that it will be used as a Trojan horse for intelligence-gathering by Iran’s enemies such as the U.S. and Israel. 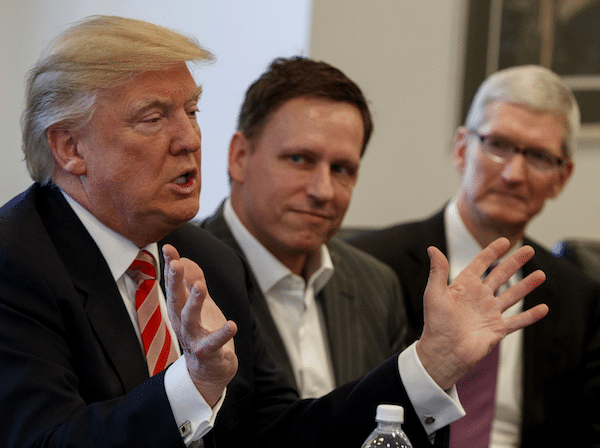 On April 4, hours after a late-night telephone conversation between Trump and Israeli Prime Minister Benjamin Netanyahu, Trump dined with Israeli-born Oracle Corp. CEO Safra Catz and Palantir co-founder Thiel. While the contents of their discussions aren’t known, Thiel’s own politics reveal his hard-right-wing tendencies. A billionaire venture capitalist from South Africa, Thiel has earned notoriety for his business ties to alt-right techies, his campaign to destroy web publisher Gawker, his belief that “freedom and democracy [aren’t] compatible,” and his $1.25 million donation to Donald Trump’s presidential campaign, among other controversies. A sound economic system working efficiently, and moral issues were irrelevant. Thiel’s extremist and misanthropic right-wing leanings cast a sinister light on his motive for building a totalitarian data-mining platform such as Palantir, while his own personal ties to Trump – an avowed enemy of the Iran nuclear deal – raises major red flags about his company’s central role in the IAEA inspection regime. Netanyahu’s presentation of a trove of data related to an alleged Iranian nuclear weapons program has been derided as old news by Russia and the usual “cartoonish” anti-Iranian fare by officials in Tehran, yet was cited by Trump as “proof” that he was “100 percent right” in his opposition to the JCPOA. Now Palantir will likely be used by the IAEA to verify the data. Given that Netanyahu claims that the 55,000 files on 183 CDs were stolen from Tehran by agents of the Israeli Mossad, however, the possibility exists that information could have been intentionally planted for the purpose of compromising Iran’s compliance with the JCPOA in the IAEA’s eyes – justifying the reinstatement of sanctions and offering a possible casus belli for Iran’s foes to launch military action. Experts warn of the danger that false positives and exaggerated links could be generated by Palantir, depicting the specter of illicit Iranian nuclear activities when no such activity exists. As the deal teeters on the brink of abyss following Trump’s withdrawal from the JCPOA, the IAEA will continue to rely on a platform intimately tied to the U.S. homeland security, domestic repression and global espionage apparatus. Indeed, the automation of the IAEA inspections regime and the danger of its intentional manipulation by intelligence agencies – not to mention its U.S. government-linked co-founder – could be one of the greatest dangers faced by the 2015 nuclear agreement with Iran, not to mention the agency’s potential future activities in countries such as North Korea.